Each week, in both the summer and winter, the first two shirts I wear after doing laundry are from my favorite foodie t-shirt company, Flavour Gallery. 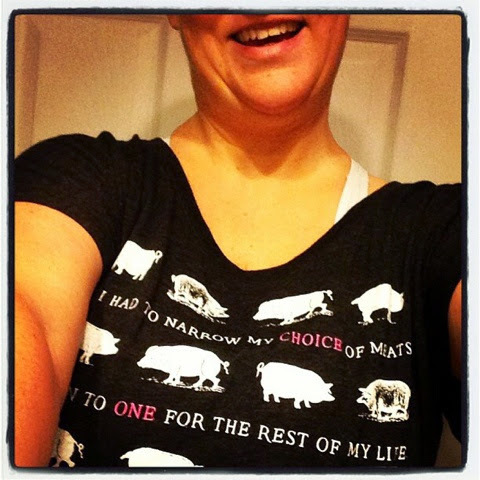 In the winter, I enjoy my two James Beard shirts, one simply imploring, "eat," the other extolling the virtues of pork. In warmer climes, the "don't touch my foie gras," and salt tank tops are my go tos. I wear them because they're soft, roomy, and funny. The quality on all four shirts is excellent, and they are the best for sleeping or working out, because they're so soft and non-constricting. If you've read my blog around the holidays for any of the last five years, you've probably noticed how much I pimp Flavour Gallery...well, they noticed too. 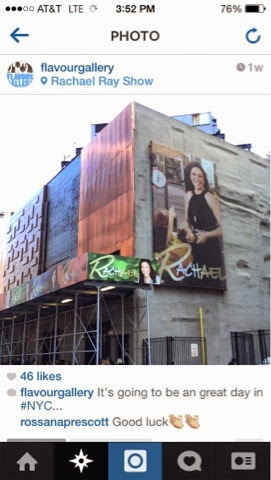 So when the brand Instgrammed a photo of the Rachael Ray Show's official shop a couple weeks ago - stocked with RR-themed Flavour Gallery goodies, I freaked out. And then I contacted them. I love Rachael Ray. Some of you more highbrow foodies, the culinary school grads and Bourdain devotees, will scoff at this. "She's not a chef," you're shrieking. I know all the arguments! But you know who Rachael is? An Upstate NY girl who liked food, persued a way to make her passion for it pay her bills, worked hard, and made good. She's taught thousands of people to get dinner on the table for their families in an unpretentious but delicious way, and despite her fame and fortune, she still remembers her hometown purveyors like Oscar's Smokehouse, near Lake George, encouraing her viewers to patronize them. As an Upstate NY girl passionate about food myself, I am inspired by Rachael, and I simply love Flavour Gallery. So when I deduced from Instagram that FG was starting an RR line, I jumped on the opportunity to blog about it immediately. Erin, the super cool social media maven at Flavour Gallery, and I have chatted before about them sponsoring a giveaway for my Big Hungries, and I knew this was the perfect time. 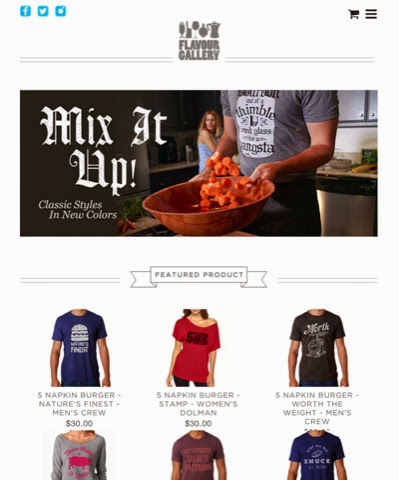 So, here's the deal: Flavour Gallery and I are giving away a women's t-shirt from their brand spanking new Rachael Ray Show line. The shirt simply and stylishly lists yumm-o Italian ingredients and dishes for which Rachael is known. The winner will get to choose the size of the shirt (small through XL), and it will be shipped to you on culinary angels' wings post haste from FG headquarters. All you have to do is add a comment to this post (not on my Facebook page or Instagram) with your name and why YOU love either Rachael Ray or Flavour Gallery (or both!) by midnight on Friday, December 5. I will contact the winner, chosen at random from the entries, for his or her mailing info. It's cool, yes? Let's be honest, I'm going to have to get one for myself. I adore it already and can tell I'm going to want to wear that to Zumba class in January, as I vainly try to shake off the metric tonnage of macarons and gravy I'm bound to consume this holiday season. I'm hoping you guys are as jazzed by this contest as I am. My enthusiasm for Flavor Gallery's designs (a couple of Anne Burrell's shirts were on my Christmas wish list this year, too) paired with Rachael's infectious foodie energy is an irresistible combo, especially at the holidays. You could choose to give your prize to a loved one on your Christmas list or keep it for yourself. 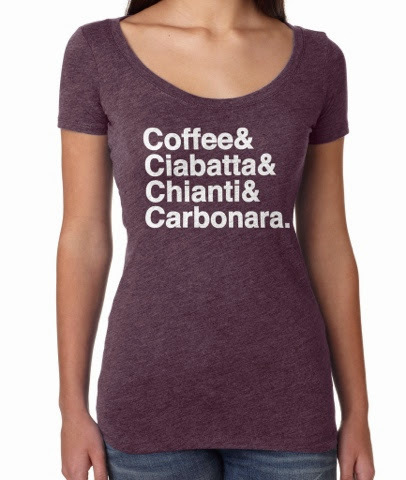 You might cook in it or wear it to your favorite Italian trattoria for a plate of carbonara and a nice chianti. You should check out the rest of the Rachael Ray line at FG, plus designs from Andrew Zimmern, Chris Cosentino, Jeff Mauro, and a bunch of other badasses. 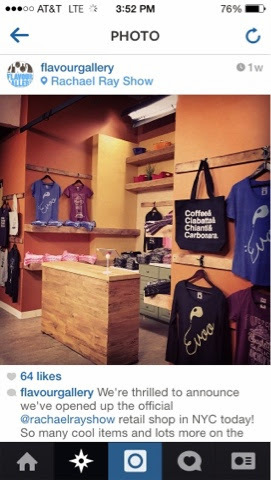 I actually already have an FG shirt in my possession for someone on my gift list - that person is so lucky! So think up a fun comment and throw your hat in the ring. May the odds (and the ciabatta) be ever in your favor! My personality is big; my hunger is bigger! Great giveaway! I love that Rachael has shown people that you can get good, healthy food on the table without a zillion ingredients, fuss, or time. I think she's encouraged more people to try to get a good meal on the table for their families. I love that Rachael's recipes are so easy to recreate at home and even though I have never been able to get dinner on the table in 30 minutes, I've never been disappointed in her dishes. Count me in! Rachael Ray taught me how to cook. For real. Several years ago, I was laid up after a surgery and facing the reality that I needed to turn my health around, which meant I needed to learn to cook. With real ingredients like vegetables. I randomly started watching Rachael's 30-minute meals show on Food Network and realized I could do some of the things she was doing. She made me stop fearing the kitchen. I love this, Erin! I have learned so much from watching her - little tricks I use every day in my kitchen like smashing garlic, adding the salt to water only after it's come to a boil, and reserving a cup of pasta water to adjust the consistency of my sauces. She may not be a Top Chef or helm a cutting edge restaurant, but she's the home cook's best friend. I want the culinary angels to visit me! I've watched a LOT of 30-Minute Meals and $40 a Day. I love Rachael's "realness." She uses real food, she's sometimes goofy and just seems like a fun, friendly person. And I don't know why I've never looked at Flavour Gallery before! I think some people on my Christmas list will be receiving gifts from there! Yeahhhhhhhhh.....I''m going to go ahead and need that. I love RR's simple recipes and a good t-shirt!